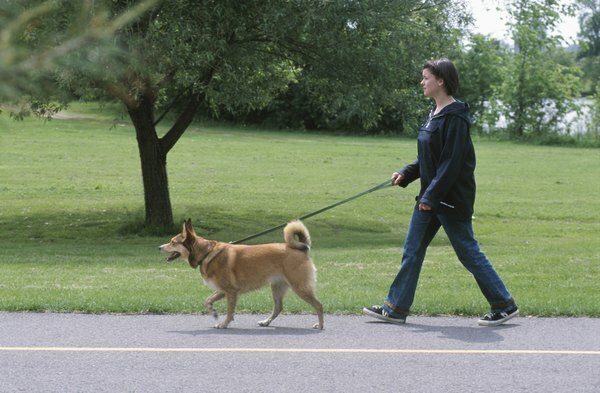 Even a stubborn dog can learn to walk nicely on the leash. The best way to ensure your dog doesn't pull you along while walking on a leash is to train him to heel. Even the most reticent dog can learn to walk like a gentleman. In the meantime, though, you may need a little help to keep your dog from pulling. Gentle Leader and Haltie are two brand names for collars that fit over the dog's head and snout. The system works somewhat like a horse bridle in that it directs the dog's head and his body follows. It's frequently mistaken for a muzzle, but it doesn't inhibit the dog's jaws, so he can still open his mouth to bark, eat and drink. The lead is attached to a ring under the dog's chin. These collars are very effective for stubborn dogs or dogs not reliably trained to heel. Limited slip collars, also called Martingale collars, are somewhat effective in preventing dogs from pulling. Their design includes a length of chain or nylon with two rings, one on each end. A second slip of fabric is drawn up through the two rings, and when the lead is pulled, the rings are pulled up, tightening the collar, similar to the way a purse seine works. These collars are effective for dogs who tend to pull backwards in an attempt to slip out of the collar, but they also can help with pulling on the lead. They're more comfortable than other slip collars, but they exert a great deal of pressure on the trachea and are not recommended for dogs with collapsing trachea issues. Pinch collars, also called prong collars, should only be used on dogs with thick, muscular necks and who stubbornly refuse to heel. They are among a type of collar referred to as "aversion collars" because they're uncomfortable and cause the dog to develop an aversion to the discomfort, figure out a way to make it stop and eventually learn not to pull. They feature a circular metal chain with prongs that dig into the dog's neck and throat when tightened. They are a tool of last resort, as is the choke collar. Another aversion tool, the choke collar is a tricky device that works well with dogs who are very strong and tend to pull hard. However, the handler must know how to apply the choke collar and use it effectively if it's going to stop a dog from pulling. Many dog owners who use a choke collar without the counsel of a dog trainer find they're using it backwards and ineffectively. Choke and prong collars are the least humane methods of controlling pulling and should only be used when absolutely necessary and with the guidance of a professional dog trainer. They should never be left on as a regular collar as they can catch on something and harm your dog. Though not technically collars, a no-pull harness is very effective at controlling pulling by exerting pressure on the dog's chest or legs when he pulls on the leash. It's humane and a good alternative for dogs who are very strong or have a collapsing trachea.